Chosen by professional clinics for it's power, sophistication and ease of use. Comes with a dedicated notebook computer, optical mouse, 2 wrist straps, 4 sticky pads, 2 plasma tubes and instructions. Delivers 11.78 MHz and 11.43 MHz that Dr. Rife used for Cancer at the Mayo Clinic. The two tube configuration generates a high energy pathway between the tubes, delivering over 10 times as much as most single tube systems. This is an 8TH GENERATION PRODUCT that is the result of over 10 years of development by professional Hardware, Quality, Reliability and Software Engineers. This model is designed for professional use in a clinical environment where severe and complicated conditions need to be addressed. It delivers faster results when both plasma tubes and body contacts are used simultaneously and it is able to reach frequencies needed for difficult cases. THREE SUBJECTS CAN USE IT SIMULTANEOUSLY when wrist straps, sticky pads and plasma tubes are all used at the same time. Delivers up to 3 frequencies simultaneously up to 20,000,000 Hz and up to 60V P-P with indicators showing micro-current, radio, light and plasma wave delivery. Comes with a 14" notebook computer with pre-loaded programing instructions that allows sweeping, pulsing, converging and many more sophisticated functions. Includes a specially configured optical mouse that allows computer operation while running a program. The Photon Probe Pro plugs into the back for wound healing and eyesight improvement. One year warranty covers parts and labor for the entire product except for glass breakage of the tubes. 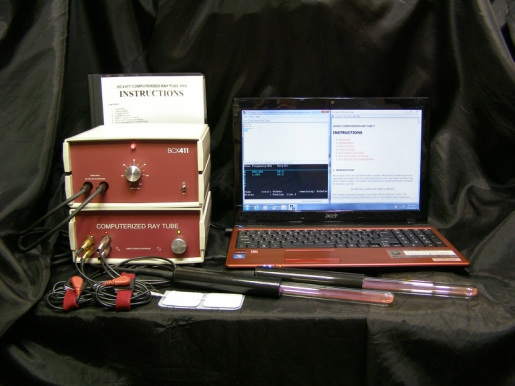 BCX411 COMPUTERIZED RAY TUBE PROFESSIONAL including computer, plasma tubes, wrist straps, sticky pads, optical mouse and instructions: Call 425-772-2278 for pricing.